This quick & easy recipe for Chinese Stir-Fry is the perfect weeknight meal! With only a few ingredients and ready in just 20 minutes, this Chinese Stir-Fry is sure to be your new go-to recipe. This Chinese Stir-Fry is so easy, you’ll have it ready before the takeout could have been delivered. At least twice a month, if not more often, we buy one of the cooked rotisserie chickens from the grocery store. They are hands-down one of the healthiest and easiest options out there when you’re short on time. I make them into any number of different things. Sometimes we’ll just eat the different cuts, other times I’ll pull all the chicken, make some mayo, and turn it into chicken salad. This stir fry recipe came about one night when we had the rotisserie chicken and not much else in the fridge. I dug in the freezer, found a bag of Chinese stir-fry vegetables & a bag of cauliflower rice. I put together a few ingredients to create a stir-fry sauce, and voilà, dinner was done! How do you make stir-fry? All stir-fry means is that the food is rapidly cooked over high heat while stirring quickly. You don’t need any special pans, or tools, or knowledge of how to make stir-fry to make this recipe. Just a pan, a stovetop, and something to stir with, and you’re in business! 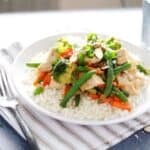 This article gives a great overview of basic stir-fry technique, which you can use for this recipe as well – just be aware that with paleo ingredient substitutions, you’ll have slightly different outcomes and cooking times, particularly with the cauliflower rice. 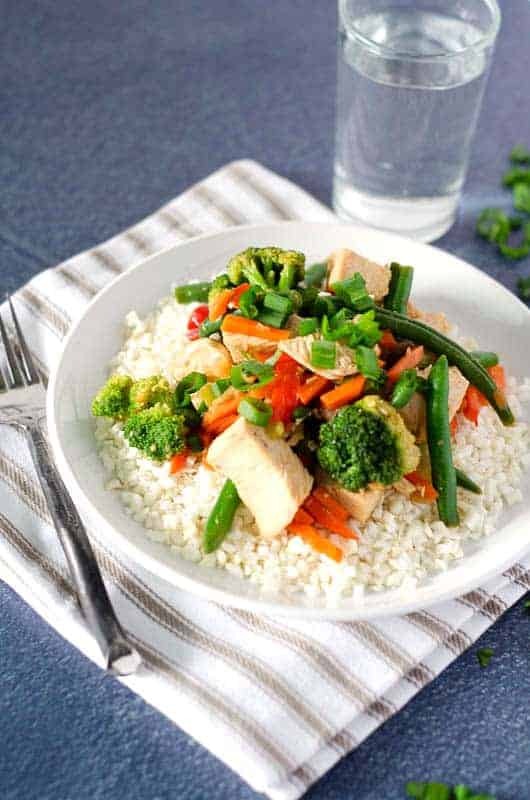 Traditional stir-fry typically includes rice, a protein, vegetables, and a sauce. 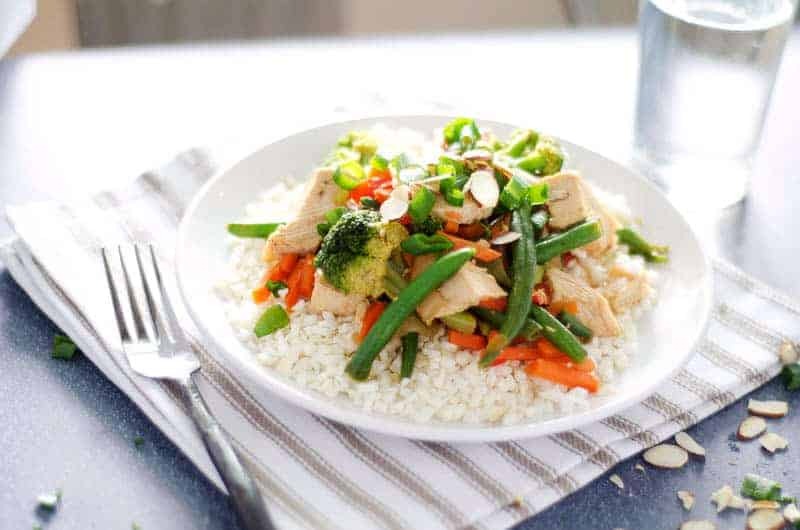 This paleo version subs cauliflower rice for the regular rice, and has a few paleo substitutions with the sauce ingredients, but otherwise it sticks with the basics – protein and veggies. What goes in stir-fry sauce? You can make stir-fry sauce with any number of ingredients. Feel free to use my recipe below, or get creative! You can sub flavors and ingredients for things that you like or have on hand. If you’re paleo, you’ll want to use coconut aminos in lieu of soy sauce. This seriously couldn’t be easier. 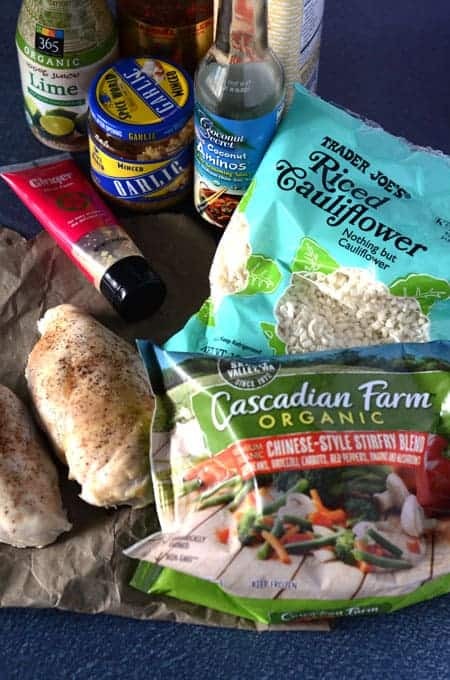 Bagged frozen vegetables that require no chopping, chicken that’s already cooked, and a little sauce that you can whip together in 5 minutes – it doesn’t get easier than that. 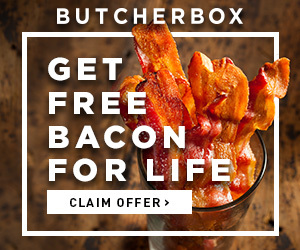 You’ll have dinner done in no time. Garnish with sliced almonds and chopped green onions to make your family think they’re getting a “gourmet” meal! And remember, there’s no limits on this easy weeknight stir-fry. You can add your own veggies, use uncooked chicken and chop it up and cook it in the pan before everything else. You can add a kick to the sauce if you want it spicier (it’s already got a kick from that chili sauce!) or tone it down if spice isn’t your thing. In a small bowl, combine the coconut aminos, lime juice, chili paste, minced garlic, fish sauce, and ginger. Whisk well. Cut the chicken breasts off the chicken and chop or shred the meat into bite size pieces. Heat a wok or non-stick skillet over medium-high heat. Once the pan is hot, add the bag of frozen veggies and stir frequently. Allow to cook for 3-4 minutes, until defrosted and beginning to soften. Add the cauliflower rice to the pan, stirring frequently, and allow to cook for 2-3 more minutes. Add the chicken and the stir-fry sauce to the pan, continuing to stir, until chicken is heated through and veggies are cooked. Top with green onions, sliced almonds, or other garnish and serve. Get creative! What did you add to your stir-fry? Post it on social media and tag me – @paleoscaleo. I want to see!